Map from Earth Conservancy’s first Land Use Plan (1996). After its formation, Earth Conservancy developed a series of comprehensive land use plans, which at the time were unprecedented in Luzerne County. Each plan focused on a different aspect of potential development in the region. All incorporated environmental, economic, and social Best Management Practices to guide the reclamation of EC’s 16,496 acres. To date, Earth Conservancy has completed seven major land use plans, which are available via separate pages on this website. Earth Conservancy’s initial Land Use Plan (LUP) considered the former Blue Coal lands in their entirety. The intent was to determine both reclamation priorities and the most responsible course for future land development and conservation. Thirty-eight local and regional stakeholders served on the project’s steering committee, 11 of whom were municipal representatives. The LUP designated 2,800 acres for residential development; and another 2,200 acres for industry and commerce. Most importantly, 10,000 acres would be set aside for greenways and recreational space. Completed in 1999, the Lower Wyoming Valley Open Space Master Plan concentrated on the best potential uses for the 10,000 acres earmarked for green/recreational space in the original LUP. Mixed-use land planning encourages smart growth, stressing connection and efficiency. EC’s Mixed-Use Master Plan (MUP) utilized this perspective, incorporating commercial, industrial, residential, retail, and recreational development along the S.R. 29 corridor in Hanover and Newport Townships, and Nanticoke City. 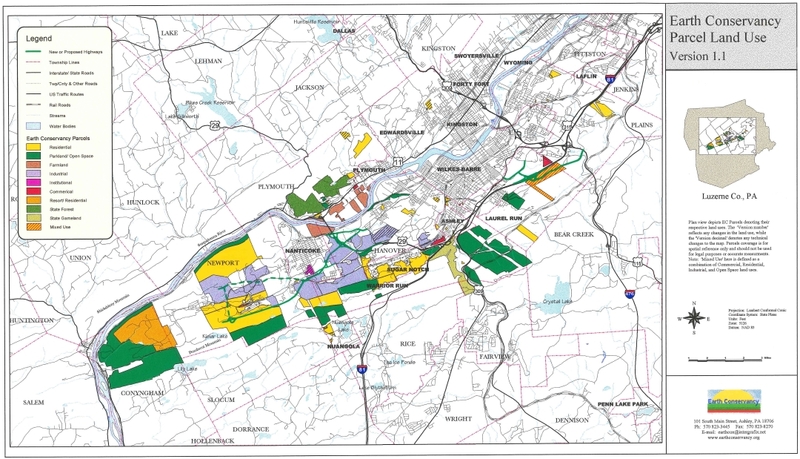 EC’s MUP was the first comprehensive land use plan of this type in Luzerne County. This plan, prepared for Earth Conservancy and Luzerne County, informed the development of the Highland Park Boulevard exit from I-81 and detailed an alignment for a new connector road. It also outlined recreation and development opportunities for more than 800 acres of land adjacent to I-81. Potential options for all-terrain vehicle (ATV) riding in the lower Wyoming Valley were explored in Earth Conservancy’s ATV Feasibility Study. A steering committee of representatives from state and local governments, public utilities, ATV clubs and dealers, and local residents, guided discussions, including possible sites. EC concluded that because of liability issues, it was not feasible to construct an ATV park on its property. A follow-up study was considered by Luzerne County. The Plymouth Township Land Use Feasibility Study examined development of approximately 350 acres of Earth Conservancy land in an area known as Avondale Pit. Informed by demographics and market analysis, the study recommended that improvements to the parcel balance residential and recreational opportunities, while also maximizing its inherent physical attributes. The Reuse Analysis and Sustainable Redevelopment Framework for Earth Conservancy South Valley Corridor Lands was completed in 2008. The study, covering Nanticoke City, Hanover Township, and Newport Township, all located in the Wyoming Valley, which runs in a northeast to southwest direction from Wilkes-Barre through Newport Township. Earth Conservancy owns approximately 1,150 acres in those areas. The study found that the Wyoming Valley has some existing characteristics that are key to the foundation of developing a smart growth plan, including an existing network town and village centers, a transit system, and abundant recreational amenities. While improvements would be needed to begin the development process, the foundation exists to accept smart growth planning. The Hanover Crossings study, conducted by Earth Conservancy in partnership with the Greater Wilkes-Barre Chamber of Business and Industry, investigated the potential development of more than 600 acres of vacant land straddling S.R. 29 in Hanover Township and the City of Nanticoke. EC’s most recent land use plan was developed to thoughtfully plan for future reclamation, watershed restoration, and redevelopment projects across Wilkes-Barre Mountain. The area comprises over 2,000 acres. EC has already began reclamation activities on the Bliss Bank site and on the restoration of Espy Run, which currently is lost underground into the mines. As detailed in the plan, approximately 1,200 acres will be allocated to recreation and greenspace. Please Note: Some of the linked files are large. They may take a few moments to download.